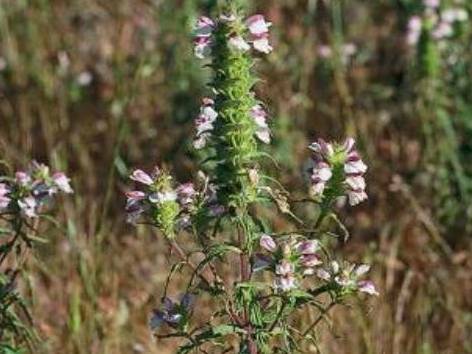 Synonyms: Bartsia trixago L., Rhinanthus trixago L.
Bellardia trixago (bellardia) is an annual herb (family Scrophulariaceae) found in the San Francisco Bay region, southern Sacramento Valley, western North Coast Ranges and central coast of California. It is commonly found in disturbed grasslands, including rare serpentine grasslands, as well as along roadsides and in fields. Bellardia is a hemi-parasitic plant that connects its shallow roots to those of host plants. The plants rely on these host plants to obtain necessary nutrients for survival, but is capable of photosynthesis. The impacts and invasiveness of bellardia are generally minor, but it can crowd out rare native plants that are endemic to serpentine soils.